Welcome to the accommodation section; listing bed and breakfast and hotel accommodation in Bexhill-on-Sea. Prices quoted above are in Pounds Sterling. Should you wish to convert these to Euros or Dollars, try this currency converter. Offers free WiFi, an en suite shower room or private bathroom with free toiletries, a flat-screen TV, and tea/coffee making facilities. Arden House is 8 minutes walk from the beach. Located only 1 minute from the De La Warr Pavilion and seafront and 10 minutes from Bexhill railway station. Quality rooms with free WiFI. Situated opposite the De La Warr Pavilion. Rooms are all en-suite and comfortably furnished, many with sea-views. Located just 1 minute from Bexhill station, 3 minutes to the town centre and numerous restaurants and just 5 minutes from the De La Warr Pavilion. Offers well-equipped rooms including WiFi, flat-screen TV and tea and coffee. English Rose is 5 minutes walk from the beach and town centre. A privately owned hotel located directly on the beach in Cooden. 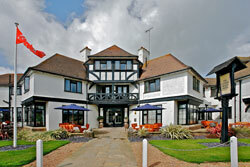 The hotel boasts views of the ocean and across Pevensey Bay.